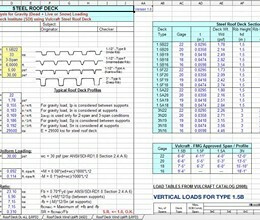 ROOFDECK is a spreadsheet program written in MS-Excel for the purpose of analysis and design of roofs with steel deck. Specifically, roof decks subjected to gravity loading (dead + live or snow) and wind uplift loading can be analyzed using either ASD or LRFD methods. Bending stresses as well as deflections are checked. Roof decks can be analyzed for either 1-span, 2-span, or 3-span configurations. 3. 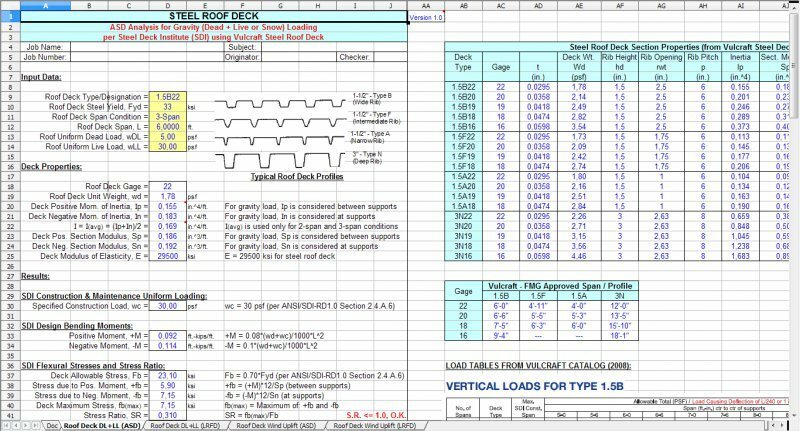 While the user can quickly and easily make a roof deck selection based on gravity loads directly from the Vulcraft catalog, the "Roof Deck DL+LL (ASD)" and "Roof Deck DL+LL (LRFD)" worksheets provide the user with the ability to demonstrate the selection and analysis with actual calculations if desired or required. 4. In most deck vendor catalogs, only the deck moment of inertia for positive bending, "Ip", is used for deflection calculations. However, in the "Roof Deck DL+LL (ASD)" and "Roof Deck DL+LL (LRFD)" worksheets, the value of "Ip" is used only for a single-span conditions. For multispan conditions, these two worksheets use the average value, I(avg) = (Ip+In)/2, for deflection calculations as noted on page 4 of Reference 1c above. 5. In the "Roof Deck Wind Uplift (ASD)" and "Roof Deck Wind Uplift (LRFD)" worksheets, roof uplift wind pressures for roof zones 1, 2, and 3 can be derived from the applicable ASCE 7 Standard when meeting the provisions of Factory Mutual Global is not required. When meeting the provisions of Factory Mutual Global is required, roof uplift wind ratings for roof zones 1, 2, and 3 can be derived from FMG Data Sheet 1-28: "Wind Design" (Reference 1c above). 6. For components and cladding (roof deck, fasteners, and above deck components), FMG 1-28 requires that the effective area be set = 10 ft.^2 along with an Importance Factor = 1.15. For secondary supporting members (purlins or joists) per FMG 1-28 Section 2.2.3, refer to applicable ASCE 7 Standard and apply the appropriate effective tributary area along with an Importance Factor = 1.15. * ROOFDECK download link provides freeware version of the software. The free RoofDek Analysis software allows Structural Engineers and specifiers to conduct full deck analysis to Eurocode 3 and 9. STIFFNER is a spreadsheet program written in MS-Excel for the purpose of analysis of steel beams subject to concentrated loads. Quick and simplified torsion analysis of W, S, M, and HP steel beams. ROOFDECK has been rated 5.0 out of 5 points. A total of 2 votes cast and 0 users reviewed the software.